The Handa contingent at Billabong Koala and Wildlife Park. Picture courtesy of Port Macquarie-Hastings Council. 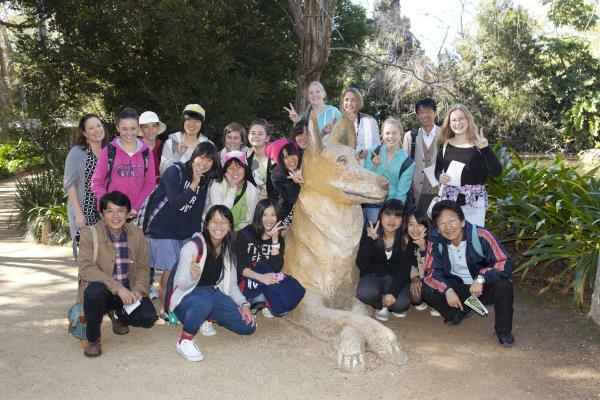 THE ties between Port Macquarie-Hastings and its Japanese Sister City Handa were strengthened last week, thanks to a visit from some special students. A delegation of 12 students and three teachers from the Handa Higashi Senior High School arrived in Port Macquarie on Friday for a five-day visit. The group were billeted out during their stay by families from St Columba Anglican School. Mayor Peter Besseling said Port Macquarie had enjoyed a long-standing relationship with Handa with many friendships formed over the years. Next year will mark the 25th anniversary of the Sister City Agreement between Port Macquarie Hastings Council and Handa City Council. The visiting students and teachers arrived Friday afternoon, heading straight to the Council Chambers for an official welcome. Spending Friday evening, all day Saturday and Sunday morning with their respective host families, they then attended a barbecue lunch at Sister City Park, Settlement Point on Sunday. The informal event was attended by members of the Sister City Sub-Committee (including chairman, Mayor Peter Besseling), host families and St Columba representatives. The focus was on fun with plenty of ball games and other activities. On Monday, the visitors spent the day at St Columba Anglican School while Tuesday, they enjoyed a visit to the Sea Acres Cultural Centre and the Billabong Koala Park as well as a farewell function at the Port City Bowling Club. Yesterday was a Hastings River cruise and a fish and chip lunch before they flew out to Sydney. “Obviously, it’s a great opportunity for the Handa students to learn more about Australia and the Australian way of life but as hosts we all have an opportunity to benefit from this cultural exchange,” Cr Besseling said.